Granted, in a large company, the prudent move would be to talk to your chain of command and possibly even file a complaint with HR. However, this office has fewer than ten employees; I don’t think it even has an HR person. What do you do then? She told me that she wanted to take the high road and stay in the office to fight this person; as she put it, “I don’t want (this person) to win.” I told her, you need to update your resume. If (this person) causes you that much stress, and your work environment is that toxic, then (this person) has already won. As vaguely as I’m trying to describe this, I also wanted to write about it because I think it’s a very important point. Toxic work environments are one of the top reasons (if not the top reason) why people leave jobs. I, myself, have left jobs because of abusive managers or coworkers; I remember one position where the CEO was so verbally abusive that I actively pushed my resume and took the first offer I got. I was absolutely miserable working for that person, and I could not leave that place fast enough. Professionally, one of the worst things you can do is continue working in a toxic work culture. At the risk of stating the obvious, it’s not fun. It brings down your workplace morale, which, in turn, leads to unproductive stress, resentment, and a number of health issues (both physical and mental). Those of us who are working professionals (that is, excluding full-time students and retirees) spend most of our waking hours at the office. 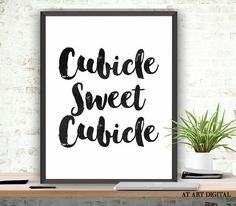 (For those of you who don’t actually work in an “office” — construction workers and professional athletes, for example — for purposes of this article, construction sites and athletic facilities count as your “office.”) My workspace is effectively my home away from home, so I want it to be comfortable as possible. Many workers — myself included — will often decorate their workspaces with a few touches to reflect their personalities; I’ll usually have my wife’s picture on my desk and a Syracuse Orange poster or pennant on the wall. If I’m working on something mundane, I’ll often put on headphones and listen to music, or if the Yankees are playing a rare weekday day game, I’ll tune in and listen to the ballgame while I work. I’m a big believer that a happy and comfortable worker is a productive worker (this might seem to contradict my earlier article about being comfortable, but that is a completely different context that isn’t applicable here). You don’t want or need anything in the office that brings you down, and you don’t want to be constantly looking over your shoulder. If a situation arises that disrupts your productive routine, you need to deal with it. If it’s something that can be addressed relatively straightforwardly — say, talking to your supervisor or HR — then take whatever steps are necessary to do so. But if it’s a situation where the workplace culture and environment are infected, then it’s probably time to send out your resume. This is the last (for now, unless I come up with anything else — which is entirely possible) article that came out of my experience last weekend with SQL Saturday #814. After last Saturday’s conference, George Walters and a few of his Microsoft coworkers held a session on what was billed as “Diversity, Inclusion and Careers at Microsoft” (or something to that effect). Unfortunately, I missed about the first half of the session (I had to run up to the speaker’s room to get my stuff out of there before they locked it up), so I’m unable to comment on the “diversity and inclusion” part. Speaking as an Asian-American, that’s unfortunate, since it sounded like something that could potentially appeal to me. From my perspective, it seemed like a Microsoft recruitment pitch (and I say that in a good way). They discussed opportunities at Microsoft, what was needed to apply, what they looked for, what the work environment was like, and so on. There were good questions and good discussion among the crowd in attendance, and I even contributed some suggestions of my own. For me, one of the big takeaways was the description of the work culture. If you decide you’re not happy with your career direction at Microsoft, they’ll work with you to figure out a path that works for you. It seems like there’s something for everyone there. Since I’m at an age where I’m probably closer to retirement than from my college graduation, the idea of finding a good fit appeals to me. (On the other hand, that thought would probably also appeal to a recent grad as well.) And I’ll also say that a lot of what the Microsoft reps said didn’t sound too bad, either. While I’m happy in my current position, it won’t last forever (and besides, things can happen suddenly and unexpectedly — I’ve had that happen before). So it doesn’t hurt to keep your eyes and ears open. And when it comes to potential employers, you can probably do worse than Microsoft. I had a great time speaking at SQL Saturday in Washington, DC this past weekend! Chris Bell and his team put on a great event, and it’s one to which I will definitely submit again! I wanted to write this up quickly for a couple of reasons. One is to acknowledge the SQL Saturday #814 team for the great job they did! I also wanted to write this to note a few things that I experienced — enough so that I wanted to ‘blog about them; you will see articles about these this week while they’re fresh in my mind, and I wanted to note them while I was thinking about them. First, Eugene Meidinger asked me what I thought was a very good and legitimate question. Second, I walked in on the tail end of a presentation by Kevin Feasel that I definitely wish I had seen. Third, I sat in on another presentation by Matt Cushing that I thought was very good! Finally, I sat in on a post-event session by George Walters about job opportunities at Microsoft, which I also found interesting! I will be addressing these thoughts in upcoming ‘blog articles, so stay tuned! This is a reminder that I am speaking at SQL Saturday #797, Boston (actually, Burlington, MA) this coming Saturday, Sept. 22! I will be doing my (still relatively new) presentation about networking, entitled “Networking 101: Building professional relationships” (or, the presentation previously known as “Networking: it isn’t just for breakfast anymore”). We will discuss why networking is critical for your career, how to go about doing it, and some resources to check out. You will even have an opportunity to do some networking within the confines of our room. You might even leave this session with new networking contacts you didn’t previously have! I’ll see you in Burlington this Saturday!